YouTube’s new service, which you can find fairly simply by heading over to YouTube.com/disco. For now, it all seems fairly straightforward, all you need to do is drop a name into the “Artist” box and YouTube works some kind of behind-the-scenes witchcraft and comes back to you with, on the right hand side, a list of songs to listen to by that artist. However, it’s the left hand side that’s really interesting. 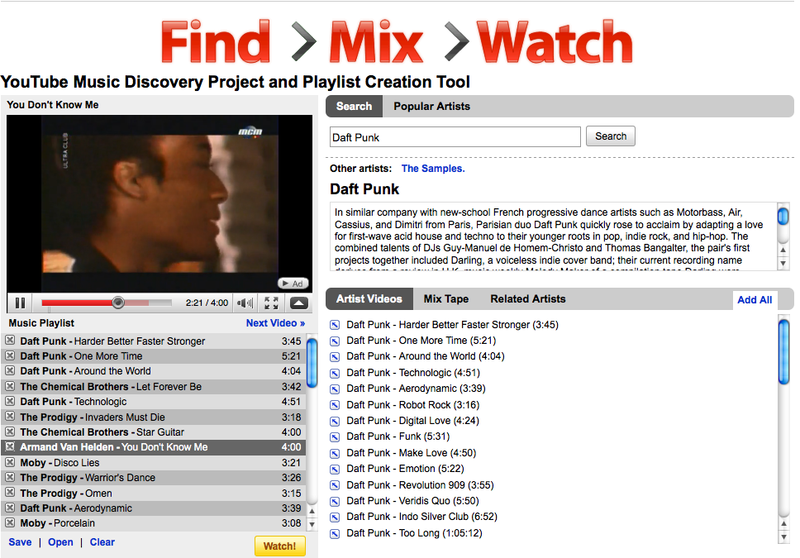 The left hand side boasts, at its top, a simple enough video player, and, directly below it, a playlist, offering a range of music by similar artists. There’s no word yet on just how that list is generated, but we wouldn’t be too surprised to learn that it’s somehow based on the listening habits of users who enjoy perusing music on YouTube, a group that we suspect will likely grow with the introduction of the new music functionality. If nothing else, it’s a very interesting turn for YouTube to take, and one that makes an awful lot of sense since the service managed to gain the rights legally offer copyrighted music in more regions. Of course, there’s no way of knowing how popular this service will get, but given the YouTube tie in, it seems likely that it’ll do very well indeed. Perhaps most important when it comes to a free music service, there’s no advertising to those users who aren’t in the mood to pay a subscription, unlike services like Spotify (though for those of us in Ireland, there’s no ads in Spotify either). Still, curious stuff, we’re enjoying it here in the office though. This entry was posted on January 21, 2010 at 11:52 am and is filed under News, Products. You can follow any responses to this entry through the RSS 2.0 feed. You can leave a response, or trackback from your own site. Last.fm does a similar job with the Similar Artists. Just go to ANY artist page, and it’ll have a few the are most similar to it, with a link to a list with more. The same thing happens with it’s music discovery feature. Listen to enough music with Last.fm “scrobbling” it all, and it’ll gather data for a list of artist’s that you will probably be into. Similar again to it’s “Neighbour” feature. It matches people’s listening habits to one another.